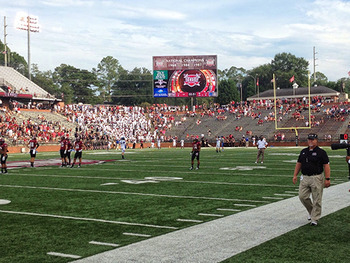 TROY, Alabama – Systems integration firm Daktronics recently upgraded the audio system at Veterans Memorial Stadium, home to the Troy University Trojans football team in Troy, Alabama. Part of an $18 million renovation, the new system features HARMAN’s JBL VLA line arrays, JBL CBT column speakers, Crown I-Tech HD and DriveCore™ Install (DCi) amplifiers, BSS Audio BLU-800 signal processing and a Soundcraft Si Performer 1 mixing console. Veterans Memorial Stadium now features a new Daktronics scoreboard in the corner of the north end zone, which is topped with three arrays of JBL VLA loudspeakers. Each array features five loudspeakers, comprised of a combination of VLA301H, VLA601H and VLA901H models. In addition, three JBL PD5200 loudspeakers are used for downfill. In under-balcony and concourse areas, 12 CBT70J column speakers provide delay fill. Crown I-Tech 4x3500HD amplifiers power the VLA loudspeakers while Crown DCi amplifiers power the rest of the JBL loudspeakers. In addition, Veterans Memorial Stadium features a BSS Audio BLU-800 digital signal processing system. The system is being managed with HARMAN’s HiQnet Audio Architect™ software. “We have had great experiences with the I-Tech HD amplifiers and they work very well together with the BSS processing,” Eckert added.